The Cathedral which caused controversy. 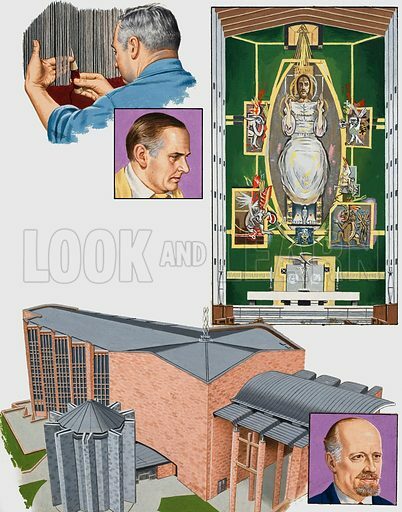 Coventry Cathedral was designed by Sir Basil Spence (inset), with a flat roof and zig-zag walls, much to the dismay of many. Top left: Weaving the altarpiece. Top centre: Gordon Sutherland, the artist and creator of the altarpiece. Top right: The Altarpiece. Original artwork for the illustration on p 23 of L&L issue no. 1000 (9 May 1981). Available worldwide for immediate download up to 3,545 x 4,513 pixels.